Now offered in powder coated black! The Stryker SG600 T-top features a sleek, modern style that will turn heads everywhere you go. But don't let the beauty alone convince you! All our t-tops are made of premium 2 inch diameter (not 1.9" or 1.5" like some competitors) 6061-T6 high tensile aircraft grade aluminum (not weaker 6063 aluminum like some competitors) with a high performance marine-grade anodized finish (full anodizing bath on completed sections after they are fabricated and welded unlike some competitors) to seal everything with the best protection against corrosion and to withstand the harshest environments. On top of that, you get a premium powder coated black finish for even greater protecting. It's very easy to maintain and will stay a beautiful dark black. Our t-top are "universal" meaning the upright leg sections can be moved in or out to snugly fit the dimansions of your center console unit. Completing the install with the massive solid aluminum top clamps and included side supporting stand offs, you will have a rock solid, beefy t-top structure with no sway, wiggle or rattle. Capable of supporting hundreds of pounds, the Stryker offers the same durability and strength of custom and OEM-installed tops but at a fraction of the price. There's no sacrifice of strength, stiffness, rigidity, or performance with our t-top compared to OEM or a custom fabricated t-top. 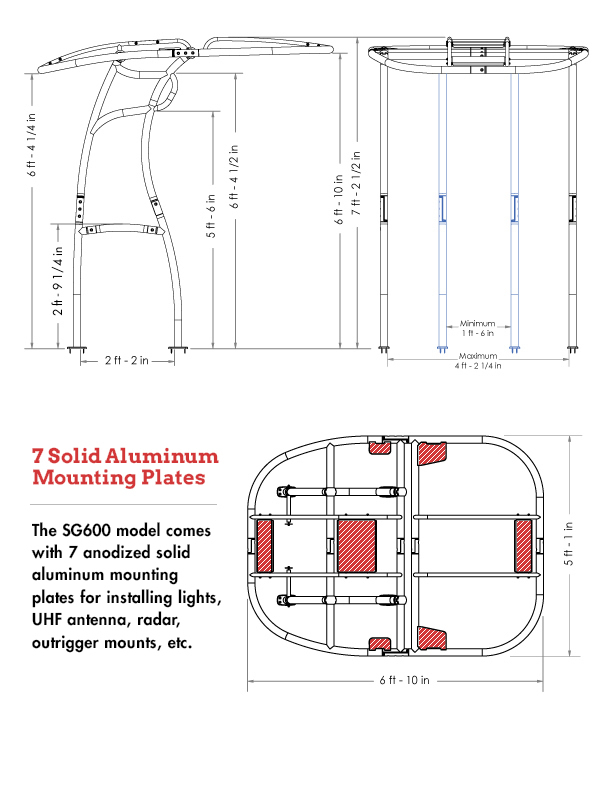 Mount all your favorite outrigger gear, lights, antenna, radar or whatever you wan to any of the 7 solid aluminum mounting plates the Stryker SG600 T-Top comes with (SG300 does not have these). The price of the t-top includes a marine-grade Sunbrella™ fade-resistant and stain-resistant canvas available in your choice of 1 of 10 standard colors(additional custom colors available at an additional fee). If you've been dealing with a standard folding bimini, you'll especially appreciate easier casting, the ability to walk your line all around the deck, and the luxury of being able to stand up straight under the shade. When you're ready to store your boat, the Stryker folds down in minutes thanks to strategically placed quick-release knobs. Even on a trailer, the Stryker SG600 T-Top will fit in most standard sized garages when folded down. Standoffs in anodized aluminum(not powder coated black) are included and can be sized for any installation. 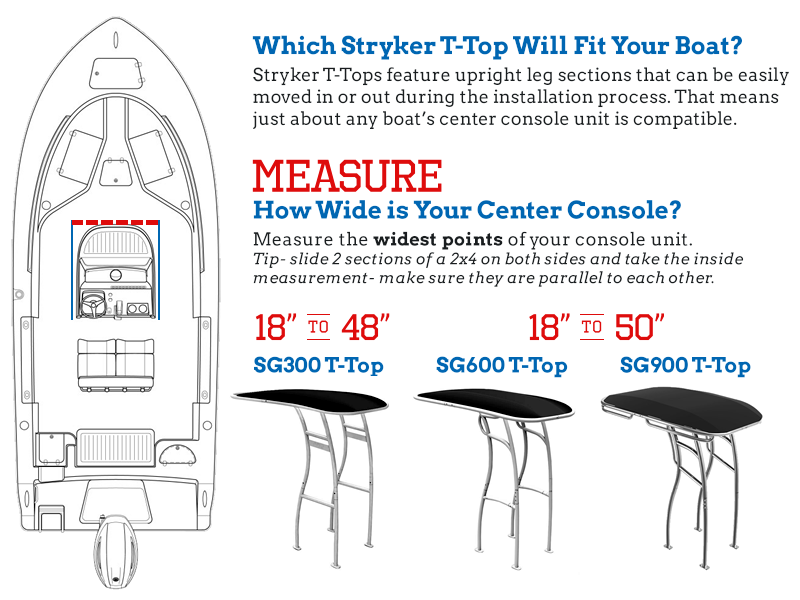 Want to know if our t-tops will fit your boat? Just measure the width of your center console unit at the base where it meets the deck. If it's 18" to 48", the SG300 T-Top will fit. If it's 18" to 50", the SG600 folding t-top will fit. Even pontoon boat owners have installed our t-tops on their boat with no problem. Looking to take your t-top to the next level? Stryker manufacturers a full line of accessories including an electronics box, rod holders, rocket launchers, antenna mounts, navigation lights and so much more. No matter what level of sports fishing you're at and regardless of what you fish for, we have everything you need to customize your t-top with affordable t-top accessories. Don't forget to click the "Buy Now" tab above to check out our specially discounted t-top packages- the more you buy all at once, the bigger the discount! All Stryker T-Tops are designed for quick assembly and installation without compromising durability. The top is packaged in two conveniently sized cartons for fast shipping via UPS. A professionally filmed 25 minute online videoprovides detailed step-by-step assembly so you can follow along plus, we have detailed installation manuals. Plus, our fully staffed sales and support team are just a phone call away if you have questions. All that's needed are some basic household tools and a helping hand. Well over 90% of our customers have installed theirs themselves with an average of 3-5 hours all in. You too can dramatically upgrade your boat with an extremely strong and stylish t-top, get a wide area of much needed shade to extend your days fishing, add tons of room for handy accessories, and increase the value of your boat with a small investment in a Stryker T-Top. Like every single one of our other happy Stryker T-Top customers, you won't believe the quality and performance and you wish you would have done it sooner! Overall Height: 7' - 2 13/32"
Overall Top Width: 5' - 1"
Universal design fits consoles up to 50"
I absolutely LOVE the quality and looks of my new S600 black Powder Coated Boat T-Top! It is well worth it's cost. It is only a little more than some competitors' prices but the full 2" sized tubing and the higher quality make it actually less expensive in my mind. Quality has value to me! It's rock solid. This SG600 T-top is the best addition to the boat yet. Super sturdy, built awesome and looks great. Have had so many compliments on it. The 9 rod rocket launcher gets all rods up and out of the way. Wouldn't own another boat without one. Notice my son with the over sized rain jacket on before the top. He doesn't need it after the top. Thanks I love the top and customer service was top notch. I have 2007 Carolina Skiff 218DLV. This top really enhance the look and improved the function of the boat. I’m very happy with this top. I just wanted to let you know how much I like your T-top. It is well built and very easy to install as I did it myself. Your T-top is what made my Sea Ox 230 Kingfish look like a center console should look. Awesome job! great and provides much needed shade in the summer. Had people comment on how great the boat looks while trailering to the Bay(Chesapeake) .